1) Full Payment must be paid to guarantee the booking. 1)FACILITIES: 100/100 of our guests love our comfy bed (Only a few dollars enjoy the same quality as a 5 stars hotel), Strong pressure hot rain shower, 24hrs reception and on site bar & restaurant. Additional benefit FREE LUGGAGE STORAGE. 2)LOCATION: Mo Chit, the biggest transportation hub in Bangkok, a prime location for city sightseeing & short trip to Amphawa Floating Market, Ayutthaya, Kanchanaburi or Chiang Mai and more cities. A bus stop is right next to us: Visit the old city, grand palace and Khaosan road is only 30 mins with THB 13 Baht, Don Muang Airport is 30 min THB 35; Mo Chit Bus Terminal is 10 mins with THB 8 only. 5)LOCAL-LIFE LOVERS: BED TO BANGKOK Hostel is a secret place hiding in a big car-park and surrounded by old buildings at Mo Chit. Finding our location itself is the beginning of a “local Culture Journey”, the big car-park in front of our hostel was the Old Mochit Bus Terminal during 1960 – 1998 which witnessed many traveler’s stories. 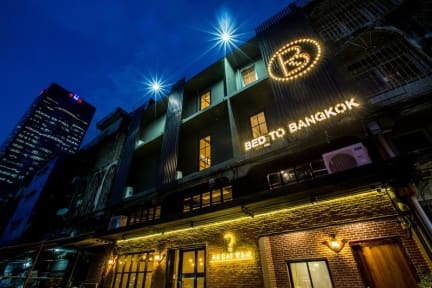 In 2017, BED TO BANGKOK Hostel converted a 35yrs old building into a modern comfy hostel to continue the stories of travelers. More must do local activities within a few steps around us, such as the famous Chatuchak Sunday Market on Fri – Sunday; Watching a free Thai boxing match at Channel 7 boxing stadium on every Sunday; Tasting the street foods is just next to door; local shopping fun at the Union Mall; Enjoy a healthy jogging at the Chatuchak Park; flowers lovers must visit the weekday Chatuchak flowers Market (opening from Mon – Thrusday). For nightlife lovers, a choice of the famous backpackers’ street Khaosan road is only 30 mins by bus, but we have a better suggestion, let’s having fun with the local Bangkokians at the nearby street of bar & pub. Wonderful staff and stay here. Slice of heaven in a local neighborhood full of street food and markets. Close to a beautiful park too! The bed was comfortable and cozy. Two secure storage units. Bathrooms were clean and beautiful. Would definitely stay here again. First of all, AMAZING air conditioning which was super important for my friend and me during this trip lol. We only stayed a night which was unfortunate but we found the staff extremely friendly & the hostel clean & immaculate. The shower pressure was also very good I found. The hostel was very close to a huge cineplex and mall so I was able to catch a movie and shop a little bit. No complaints here! This is an awesome place to stay. I highly recommend it to anyone visiting the area! Enjoyed the comfortable beds and cleanliness of the place and the restaurant was amazing. Arrived in Bangkok and it was easy to find the hostel, close to mo chit BTS station.It’s also very convenient to get to Don Mueang airport (A1 bus ). Staff very helpful and also It’s peaceful and quiet here. Would definitely stay here again. Good location, easy to walk and take a bus to Don Mueang Airport. Everyone was super friendly and helpful, good location if you’re trying to get to the airport early in the morning, but horrible location for anything else. Only place open past 9 pm for food within walking distance was the 9/11.